Real ramen – not the kind on which you subsisted in college – has an obsessive following in Japan and around the world. 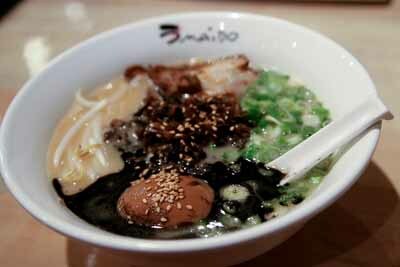 A good bowl of ramen, if it’s made right, transcends the dreariest of days. Making ramen is an art form that takes a lifetime to master. Ramen chefs work as apprentices for years before they are considered qualified enough to open their own ramen-ya, a small restaurant specializing in ramen. You must perfect your broth and noodles, which explains why older chefs generally make the best ramen. Umaido (2790 Lawrenceville Suwanee Road, Suwanee, 678-318-8568, www.umaido.co.kr) is Georgia’s first ramen-ya. Other local Japanese restaurants – such as Yakitori Jinbei, Shoya and Blue Fin Sushi – also serve the delicacy, but Umaido is the only restaurant to specialize in the once elusive comfort food. In a surprising turn of events, Umaido is Korean-owned. You see Korean influences in little touches – such as the large pitchers of barley tea and airtight stainless steel canisters of housemade kimchi cabbage – that grace the tables. The menu’s simplicity is mirrored in the minimalist décor of the loft-ish space, which is more modern than other Japanese restaurants of its ilk in Atlanta. Electronic music pumps through the speakers and most tables are occupied by young Asian teens laughing between slurps from large white bowls. Awesome! Great to see you on Creative Loafing's site! comes with numerous obstacles and challenges to overcome. How long a drive is that from Midtown? Is it worth taking my friends visiting me who used to live in Tokyo? They like the real deal.